The Norway, or brown, rat lives both as a commensal in close association with man and in the feral state. As a commensal this rat lives principally in basements, on the ground floor, or in burrows under sidewalks or outbuildings. Although more at home on the ground, these rats are adept at climbing and have been observed traveling along telephone wires from one building to another. In places they become exceedingly numerous and destructive.They constitute a menace to public health. They are known to be reservoirs of bubonic plague (transmitted to man by the bite of a flea or other insect), endemic typhus fever, ratbite fever, and a few other dreaded diseases. Because of this it is commonly said that Norway and roof rats are more dangerous than lions or tigers! Every effort should be made to exterminate them when they are found on your premises, and it is advisable to ratproof garbage cans and all buildings to prevent their entrance. Water doesn’t stop Norway rats. They can swim as far as 1/2 mile in open water, dive through water plumbing traps and travel in sewer lines, even against strong water currents. Rats are capable swimmers but only swim if necessary. 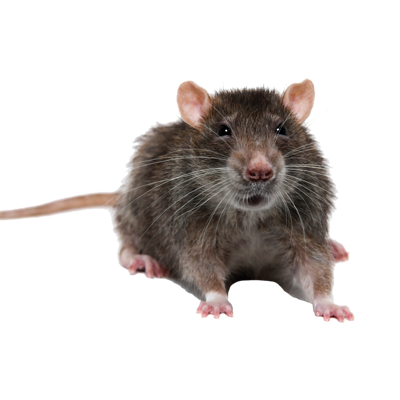 Rats constantly gnaw anything softer than their teeth, including lead sheeting, improperly-cured concrete, sun-dried adobe brick, cinder block, wood and aluminum sheeting.Since rats can fit through openings that are as small as 1/2 inch in diameter, it’s very difficult to rat-proof a building. They can burrow to a depth of four feet. Young Norway and roof rats can be sexually mature and capable of mating at 3 months of age.Female Norway rats can be pregnant with a new litter and still lactate to feed their young. However, the gestation period may be slightly longer. After giving birth, they are capable of being in heat again in 24 to 48 hours. They are in heat approximately every 4 to 5 days. They average 3 to 7 litters per year. Norway rats usually have larger litters, 6 to 12 pups. Droppings average 3/4 inch in length and are blunt at both ends. Average 30 to 180 droppings a day.